And that didn't happen. I went back to relisten to Mind Over Matter to see if I had indeed been too hard on that record, and...look, I get the appeal of a good U2-esque guitar flutter and arena rock swell, and I even thought their lyrics actually took a step in the right direction. But the production was so muddy, messy, indistinct and did absolutely nothing to flatter Sameer Gadhia vocals - which, admittedly, aren't always my thing but it could have come together better than this. But worse still were compositional problems at the roots: wild transitions in tempo and sound that almost wanted to lean towards progressive metal but didn't stick the landing, or flatter the group's knack for some decent melodic hooks. And what was most exasperating is that none of this made the record precisely bad, just overmixed and forgettable, all the more evidence that Justin Mendel-Johnson might be a far better musician than producer. So until I started getting requests to cover this, I had no idea where the band was going to go next. It seemed like they had pivoted to making shorter records, as Home Of The Strange was easily their most succinct release to date, and they had brought in producers Alex Salibian and Jeff Bhasker to add more of a boost. And truth be told, if I hadn't heard some interesting critical buzz or if I didn't need more time to work my way through discographies from Cody Jinks, Atmosphere, and Ka, i probably wouldn't have covered this. But what the hell - I've got no ill will towards Young The Giant beyond indifference, so how did the record turn out? Well, I can say this: I'd argue this is easily their best record to date. Talk about a band taking a hard left turn to get on track, because I was genuinely surprised how much the band was willing to correct their course and seemingly respond to the majority of criticisms they received while still maintaining a recognizable sound. Now I don't want to oversell this - you can definitely tell that Young The Giant isn't so much carving its own way as it is grabbing up chunks of other bands and grinding them together, which can make parts of this record feel rather patchwork and fragmented - but again, I don't want to deny that for once, it seems like Young The Giant is on the path to make music I won't immediately forget, and that's a plus! So let's start off with the biggest shift: the instrumentation and production, specifically the latter and how it ties into composition. In sharp contrast to the stabs at progressive rock that they made on Mind Over Matter, Home Of The Strange is far more tight and devoted to those hooks - still scattershot, this isn't a pop release and Young The Giant has a tendency to meander and not really pay off some crescendos like the opener 'Amerika', but on the right path. The prechorus build to 'Something To Believe In', the propulsive bass groove on 'Mr. 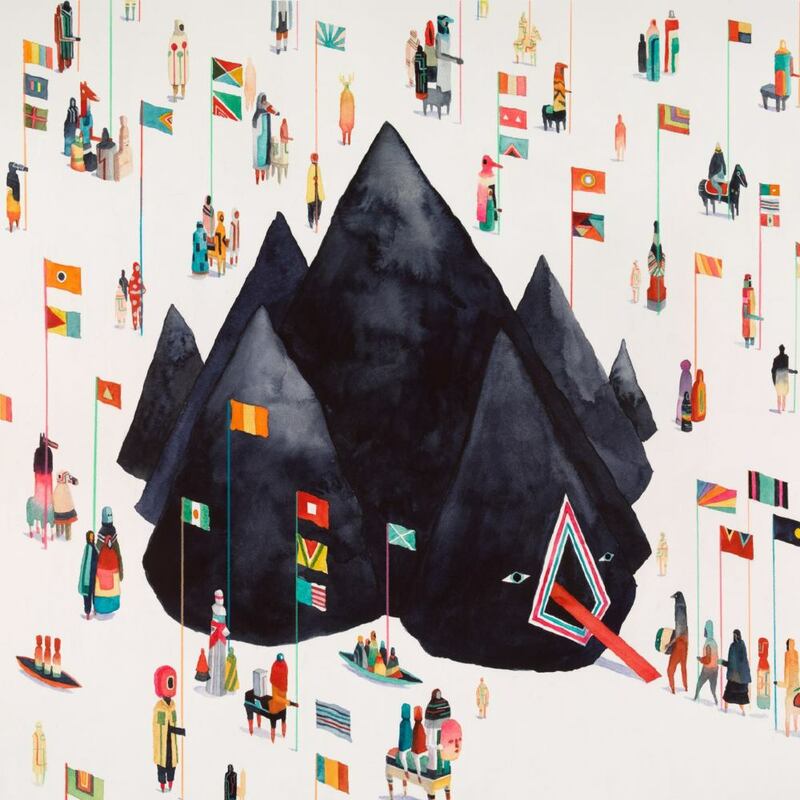 Know-It-All', to the title track with easily the most energetic blast of blistering drumming and tight groove that this record delivers, Young The Giant does have hooks here - and it's a damn shame that yet again a lot of the production seems to be getting in the way. I've never been wild about the colourless feel to much of Young The Giant's mixing, and while that's definitely still here, what caught me off-guard were how heavily compressed some of the guitar tones were like on 'Jungle Youth', or the blocky synths on 'Repeat', or how in the middle of a pretty elegant acoustic guitar-and-piano touched slow jam like 'Art Exhibit' you throw in an interlude with a chunky riff and a squealing high tone - why? And that's before we get to songs like 'Elsewhere', 'Silvertongue' and 'Nothing's Over' that are blatantly trying to grab as much early 80s Bowie as they can get away with in the sax and frontman Sameer Gadhia's lower range and the touches of new wave in the guitar and synth - including a touch of Muse in the melody of 'Nothing's Over' - and yet so much of it feels clumsier than it should. I get adding some noisier distortion, but let it carry more of a tune or don't saturate the mix in enough reverb so the guitars feel oddly colourless, especially when you're trying to run wild and repeat much of what KONGOS already did better on Egomaniac. The one place where the band let their mix build some natural swell is 'Titus Was Born', which takes a damp acoustic line and gradually builds with the organ and piano - I don't know why the oddly cold synths were added, but outside of that the song does come together well. The track also features the backing vocals of drummer Francois Comtois, and this leads to my other consistent issue with this band: frontman Sameer Gadhia. Not that he's a bad singer - outside of one squealing moment on 'Elsewhere' that was pretty awful, he actually shows a fair amount of range and versatility here as he flexes into both his falsetto and lower range, the latter of which actually had some presence. But for the most part, I'm increasingly convinced his vocal tone just doesn't match the production style Young The Giant uses - he works best when his more willowy tones can breathe or are supported with a little more body, like when Comtois comes in on 'Titus Was Born'. But more often than not, he ends up trying to cut through rougher distortion or fighting with layers of overdubbed backing vocals that don't so much support him as they do drown him out - and this should not be an issue, considering his strong mid-range and how easy it would be to give him a little more space. And yet even on tracks where that happens, compressed filters are still added to the vocal line to make Gadhia sound rougher or closer to a live/Jack White-esque vocal pickup that isn't needed! Thankfully, just like on Mind Over Matter the lyrics do come through reasonably well, with the album thematically exploring cutting one's own path in the United States when it becomes clear the 'plan' can ring hollow, be it the American dream on 'Amerika' or God's plans on 'Something To Believe In'. And what gets interesting is a real lack of cynicism here - for as much as this record could easily embrace disaffection, it keeps trying to find that workable path and isn't shy to put itself on the firing line. Take 'Mr. Know-It-All', which could have easily been just another screed against people trying to build and fake their identities instead of come to it naturally - a charge I was almost tempted to level at Young The Giant before they admitted it themselves anyway in the final verse, a nice bit of self-awareness I appreciated. And while 'Jungle Youth' can fall into some overwrought hedonism, I did like the undercurrent of optimism that ran through 'Titus Was Born' and 'Repeat', especially the acknowledgements that the earth was going to keep spinning despite failed relationships or losing purpose. I will say that Young The Giant's usual trick of abstraction did kind of fall flat on 'Silvertongue', though, where on the hook it's clear his quick talk won this girl over and yet all the verses imply that the talk is getting in the way - maybe he's referring to deeper feelings here, but I'm not seeing how the talk is getting in the way. I get the intention of the song, but it doesn't quite connect all the way for me. But overall, this is a better record than I probably expected. I'm not going to consider it great - I'm not wild about Young The Giant's blurry and oddly colourless production style, and they wear their influences a little too prominently for my tastes - but the refocus on tighter song construction and sharper grooves is a big step in the right direction, so for me... I'm thinking a 6/10 and a modest recommendation. Again, I'm not really a fan of these guys, but I can say this is easily their best record to date and if you're a fan, you'll probably really love it. Outside of that... eh, between this and the newest Arkells record you've got a reasonable selection of decent pop-leaning indie rock, so it's probably worth a listen.